One of the last candidates left standing at Miss Deaf World, Viet Nam's Miss Deaf, Le Thi Thuy Doan has used money she earned on her own to connect with deaf people across Viet Nam and the globe. Thao Van reports. Viet Nam's first representative at the Miss Deaf World, Le Thi Thuy Doan won third place at the event which has taken place in Czech Republic. During the days of this international competition, where she competed against 70 other contestants, the lively and beautiful 26-year-old Vietnamese drew much attention and created quite an impression among international friends. Doan won over the jury with her appearance, intelligence and especially, her great spirit. Born in 1989 into a farmers' family, Doan is currently a member of Ha Noi's Deaf Club, and also the vice chairwoman of the club of deaf in Long Bien District. "My family used to be very poor. Being so busy with earning money, we did not realise until she was over four months old that my daughter did not react to noise," Le Van Cong, Doan's father recalled. "We constantly drove her to an acupuncturist for treatment. When she was one year old, after a small burn accident, we had her health rechecked and felt great pains on being told that she was deaf and mute from birth," he said. Doan was very quick at learning sign language and needlework. After learning sewing in a short period of time, at the age of 16 she started work at a tailor's shop and became a very experienced seamstress of vests and shirts. Doan has been able to earn money, and used her salary to buy a laptop, which has helped her learn English, sewing, dancing and connecting with communities of deaf not only in Viet Nam, but also around the world. Her life is not just about passing time peacefully in front of the sewing machine. Doan enthusiastically participates in local clubs for the deaf, and also entered two national beauty contests for the disabled. She was among the ten best candidates in the competition Ve Dep Vang Trang Khuyet 2013 (The Beauty of the Crescent Moon 2013), which was dedicated to the handicapped in Viet Nam. 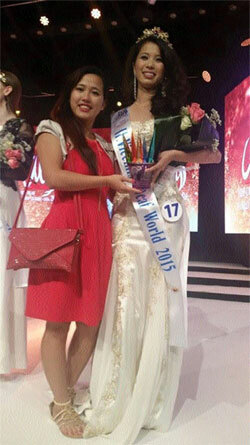 She also became the runner-up in the recent Miss Deaf Viet Nam and received an invitation to the Miss Deaf World. Doan had to overcome so many obstacles to win at the international competition, the most challenging of which unexpectedly came from her parents' objection. They initially disapproved of her participation in the Miss Deaf World when she was invited, just because of the limited financial conditions of their family. "When we persuaded her to stay home, Doan kept crying all the time. She said that she would not be happy if we prevented her," her father recalled. She wrote a letter full of tears to her parents in which she said, "I want to prove to everyone that the deaf can also do what other normal people do." After careful considerations, the family managed the expenses for Doan to travel abroad to take part in the Miss Deaf World 2015. Most of the money went into paying the air fare. As there was not enough money for other members to accompany Doan she had to travel by herself. However, the success of their daughter was really beyond the expectations of the parents and it moved her mother to tears. "My feelings at that time were indescribable," Doan's mother said. Not too many people, including Doan's parents, imagined she would have travelled to the Czech Republic, but it helped her to better herself. On coming back home, she became more confident in communicating with others, and feel more mature and full of energy. She also learnt more new things and made more friends. Moreover, via the competition, Doan expressed that she wanted to introduce beautiful images of Viet Nam's land and people to international communities. She also wanted to prove the equality and capacity of the deaf, that they could accomplish what other normal people could. Doan has become busier. In addition to teaching disabled children in Hy Vong (Hope) School next to her house, she has also participated in teaching sign language to normal people two nights every week, and also joined many social activities.